The hardest thing about Google X’s Project Loon hasn’t been the engineering challenge of beaming high-speed internet down to the far-flung corners of the world from 60,000 feet up in the sky, explained Richard DeVaul, the founder of the moonshot project. It’s trying to control all those freaking balloons. DeVaul, sporting a pair of Google Glass onstage at the Smithsonian’s “Future Is Here” event this weekend, gave us a rare behind-the-scenes glimpse at one of the secretive lab’s most high-profile snafus. The most famous of these occurred two years ago in Pike County, Kentucky. Citizens spotted and captured footage of an aerial object unlike anything they’d ever seen before floating high up in the sky. “I don’t understand how it could stay up there in one place. There was no sign of propellers or any kind of proportion system. No gas is coming out,” wrote Allen Epling, who first spotted the flying object. The airline industry reported they didn’t have any planes in that area, and police were equally stumped. After much speculation, conspiracy theories, and subsequent sightings in Virginia and Tennessee, Google admitted the mysterious floater was one of the balloons they were testing for Project Loon. The UFO community wrote the claim off as a publicity stunt, and remained skeptical. On Saturday, DeVaul revealed to the public for the first time the once-unidentified flying object. 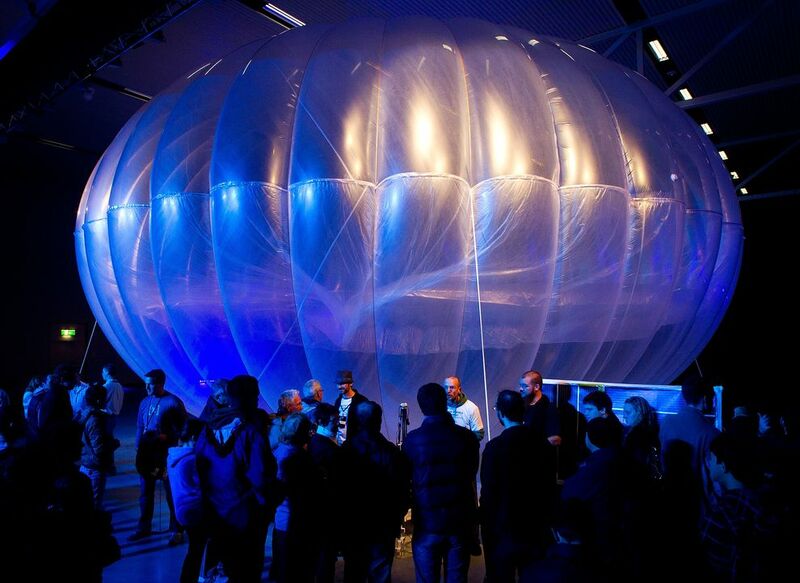 It was the “Falcon 11,” a 120-foot long transparent mylar balloon made in-house at the secret Google X lab. “This is a balloon that went rogue,” DeVaul said. The Loon team launched the massive spherical, internet-carrying balloon from California on what was supposed to be a short-duration test flight. But it “ran out of juice” and they lost track of it. They then followed its course eastward by checking in on UFO forums online. I caught up with DeVaul after the event and asked him if the Falcon 11 was still in use, or if that particular model was benched after its extraterrestrial disappearing act. Turns out it was one of many models. All the balloon prototypes are named after birds, starting with “A,” he told me. So that gives you some sense of how many attempts there have been to get the design right—and the “Falcon” is from back in 2012. When I asked DeVaul what letter they’re on now, he laughed and said unfortunately he wasn’t able to talk about that (surprise surprise), but suffice to say they were a lot further along. He then hinted that the lab is now working on totally something new—he wouldn’t confirm if it’s even a balloon—that, if successful, could stay aloft forever. Typical Google X vaguery and dramatic flare. We’ll be on the hunt for more details on that mysterious object, and in the meantime, the Project Loon team will ostensibly keep trying to perfect its balloon design. Note to UFO chasers everywhere: It might not be an alien spacecraft, it might just be an internet-carrying “Toucan” balloon gone rogue.